We are happy to accept all donations indicated on our Needed Items list in our storage space at Mariannenplatz 1, 10997 Kreuzberg. When can I bring the donations? We accept donations Wednesday, 12:00 to 16:00, and Saturday, 13:00 to 16:00. Please take a look at our updated Needed Items list, which includes all items that we are currently accepting. We can only accept what’s on the list, washed and undamaged! A high-quality donation is clean, unworn or very lightly worn and can be distributed without further mending or repair. It helps us when clothing is sorted and labeled (e.g. ‘men’s sweater M’ or ‘children’s pants [girls, 110]’). You can also tie shoes together and indicate size. Find out more about donations here. Can I also donate money? Why won’t you accept all donations? We have restricted storage space, so unfortunately we can’t accept everything. That’s why we have to limit what we accept to only what is on our Needed Items list. The items I would like to donate are not on your Needed Items list. What now? We would appreciate if you could simply wait until we’ve updated the list. We may add your items and then would be happy to receive them. If you don’t want to wait, then you can look around for other collection points in Berlin. Where can I find other storage spaces and their needed items list? Is your storage space accessible to the public? Our storage space is not publically accessible, but during our opening times there are always friendly people on site who would be happy to receive your donations. I want to start my own collection effort. How do I do it? We kindly ask that any collection effort for which we are expected to receive the donations is arranged with us in advance. We ask that you do not simply copy our item list and collect on your own accord. We can NOT guarantee the reception of items collected in this manner. Register at cooperation@kreuzberg-hilft.com. I would like to make a larger donation. How can I arrange it? For larger donations—whether that means large items or a large quantity of items—contact us at cooperation@kreuzberg-hilft.com to arrange a drop-off. This helps us to better coordinate helpers on site. Thanks! Could you pick up the items? As a rule, no. Our drivers deliver donations, but they don’t pick them up. We may make an exception in special circumstances. If you have a request in this regard, please contact us at welcome@kreuzberg-hilft. You can sort, pack and transport. We have assembled a list where you can enter how you are willing and able to lend a hand. All info can be found under Get Involved. You can help organize activities, answer emails, coordinate volunteers, organize the donation rooms and much more. 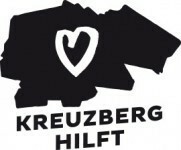 If you’d like to get involved, please contact us at help@kreuzberg-hilft.com. You are also more than welcome at our information sessions, every 1st and 3rd Monday of the month at 18:30 at Bauhütte im Besselpark, Besselstraße 1. Registration is not necessary. We hope you’ll come by! I’ve looked at the Shift Schedule link, but I don’t understand how it works. You are welcome to enter your name on this list. Please only do so if you are willing and able to carry out the given task at the designated time. Please enter a time and task that you can commit to. Please feel free to sign up for a length of time that works for you: one hour is fine, as is three. Every kind of help is welcome! We especially appreciate drivers with cars, so that the donations can get where they need to go! Please enter your first name and the first letter of your last name. If you find you can no longer attend a shift, please remove your name from the list as soon as possible, so that someone else can take your shift. For last-minute cancelations (same day) or problems with the Shift Schedule, please send an email to help@kreuzberg-hilft.com. If you have a question not addressed in our Shift Schedule, please contact us at help@kreuzberg-hilft.com. In other words, please read first, then ask. The Shift Schedule is already full, but I want to help anyway! In addition to helpers to sort and drive, we are looking for more team members. For instance, we’re looking for people to help with activities, organizers, coordinators, etc. who can help regularly. Simply send an email to help@kreuzberg-hilft.de in which you briefly introduce yourself and say how you would like to contribute and we’ll get in touch with you.